Shittim wood came from the Acacia tree, of which there are more than 1,300 species worldwide. The wood and sap of this tree has been used for many different purposes throughout time: for building, making perfume, paint, and medicines, using it in religious ceremonies and the seeds for food. 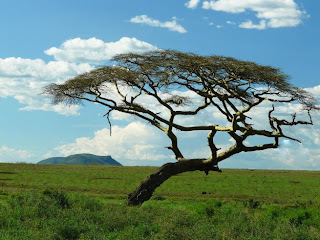 In many cultures the Acacia tree symbolizes purity, endurance of the soul, as well as resurrection and immortality. Egyptian mythology associated the acacia tree with characteristics of the tree of life, such as in the Myth of Osiris and Isis. The Ark of the Covenant and portions of the tabernacle were made from Acacia wood. The Acacia tree was native to the area in which the children of Israel found themselves. They were large trees with bent trunks, curled branches, and many knots, hardly straight for easy adaptation as boards or rods for a tabernacle (Chapter 6, 'Made According to Pattern', by C.W. Slemming). These gnarly trees had to be cut down and the milled to create useable wood for construction. For the tabernacle, 48 boards were made, each 10 cubits high and 1.5 cubits wide (thickness unknown). There were also two tenons at the bottom of the boards which fit into the silver sockets. Placed on each board were three rings (high, middle, and low) through which bars also made from Acacia wood were passed to hold the tabernacle's structure or outer wall together. Both the boards and bars were overlaid with gold. Why would the Lord direct the children of Israel to work with such a difficult material? We are like the Acacia tree. In our natural form, we are crooked and wild. We must be cut down, severed from our old ways of life and made into something new and useful. Our link and connection to the world must be broken if we are to be used by the Lord. We have often grown up in barren conditions, depleted and distant from the Lord's sustenance. However, the Lord, as the master carpenter, is willing to work with us, and make us straight so that we can stand up(right) on His foundation (the silver sockets). Once, as trees, we stood in the soil of the earth, now as refined beings, we can be set apart from the world and stand upon the foundation of the Lord's gospel. What sets us apart? Silver, the ransom price. He will protect us from the shifting sands of this world and allow us to firmly stand as one with other redeemed individuals. Both of our feet (tenons) should be planted in the gospel, not one in and the other in the world. "The sap of selfishness must be dried out; the knots of hardness must be smoothed down to gentleness and compassion; and the twists of halfheartedness must be straightened - for they will never allow for perfect fitting and a unity in the Spirit, the state in which the Lord always delights to dwell." (Made According to Pattern, p. 55). Then, when the boards of Acacia were made as straight as possible, they were overlaid with pure gold. Gold does not perish, wood does. Us, as perishable beings, are made immortal and even eternal, through the process of sanctification, and purified even as gold, clothed with his divine nature. The boards were perfectly balanced and stood in a perfect line so that there were no gaps or unevenness in the walls of the tabernacle, yet they did not rub against one another. They were also all the same height. As members of the church of Christ, we are not to judge one man above another, but we are to stand as equals, shoulder to shoulder, not leaning one way or another, but to be in perfect balance and harmony, to stand firm together in perfect function and service. For added strength, the bars of Acacia wood overlaid with pure gold allowed the boards to stand firm. The iron rod from the Book of Mormon symbolized the Word of God. This is interpreted as 1) the scriptures, which provide the words of eternal life, direction, and stability in this ever-changing world and 2) the Lord Himself, who is the Word by which all things were made, by which we are remade into His likeness through His atonement.